Please refer to our stock # 9837 when inquiring. 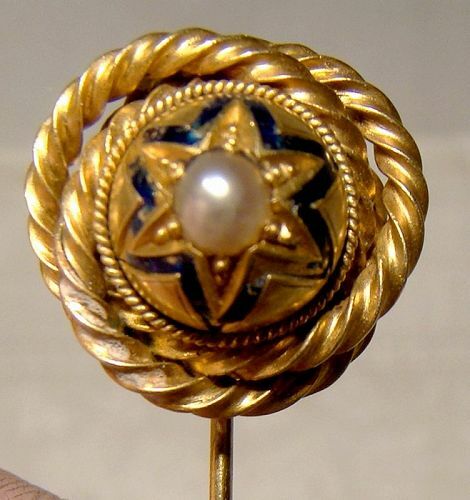 A 15k yellow gold enamel and pearl Victorian stickpin lapel brooch from the 1860s-70s. This stylish beauty features a 3/4" across head with a twisted cord decoration along with cobalt blue enamel in the shape of a star. There is a 4 mm. pearl in the center of the dome and it measures 2-3/4" long in total and it weighs 5.2 grams. It is unmarked and tests as 15k gold and it is in very good condition with no chips, cracks, dents, bends, corrosion, damage or repairs other than some minor losses to the enamel. This item is in excellent condition with no chips, cracks, dents, bends, corrosion, losses, damage or repairs. All items are thoroughly and conservatively graded and all condition issues are noted; all items are vintage or antique and may have slight signs of gentle use. Expedited tracked and insured parcel shipping to the U.S. starts at $23 (other spots may vary, air is higher). Items paid with a credit card will be shipped to confirmed addresses only. We do ship internationally. All of our prices are in $US. PLEASE NOTE: We DO NOT accept PayPal.